Campaigners against housing on Meadow Vale in Ovingdean are planning to hold a demo outside Brighton Town Hall at 3pm today (Thursday 8 May). 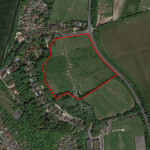 They want to make clear their opposition to proposals to build on the greenfield site before a meeting of Brighton and Hove City Council at 4.30pm this afternoon. The protest has been organised by Save the Deans. Petition Demo 3pm on 8th May Change in Venue Details – Council Chamber, Brighton Town Hall, Bartholomew Square, Brighton, BN1 1JA. At the same time members of Rottingdean Parish Council have been coming under pressure to say whether they agree with the plans for more than a hundred homes being put together by the developer Lightwood. They include the former Labour deputy leader of Brighton and Hove City Council Sue John. But political opponents are blaming Labour for leaving Meadow Vale unprotected from development saying that they excluded it from the South Downs National Park when the boundaries were being drawn up. They are also concerned that two other sites near Meadow Vale which sit within the national park are also being talked about as potentially suitable for housing. One of the members of the South Downs National Park Authority, which will decide the matter, is the former Labour council leader in Brighton and Hove, Ken Bodfish. He was vice-chairman of the South Downs Joint Committee which helped to decide which land was included in the national park. And one of the consultants advising the developer Lightwood is the former Labour MP for Hove Ivor Caplin. He previously served as the leader of Hove Borough Council and deputy leader of Brighton and Hove Council. Rottingdean Parish Council chairman Bob Webzell told the annual village meeting last month that the parish council would be consulted by the planning authority – Brighton and Hove City Council – if a planning application was submitted. He said that the parish council had received professional planning advice that it should not declare its position in advance of a planning application. Oh dear Labour! This is starting to smell! Let me get this right, Labour changed the boundary for the National Park to exclude this land, then one of their former MPs (who resigned due to the Expenses scandal) who was also Head of Brighton Council is now a consultant for the this same development land that was excluded? Is this allowed? THEY make their own rules . It really is up to US , the democracy , the people , ” oi polloi ” ( in it’s original context in Ancient Greek ) , the many , US . In ALL levels , WE must scream and shout and ask and email and allege . It is UP TO THEM to PUBLISH their interests and be TOTALLY TRANSPARENT and BE ACCOUNTABLE and prepare to be NAMED and SHAMED and SACKED , NEVER TO RETURN . This is the ” cross one has to bear ” in THIS modern world . If ya put ya MUG up , an’ you AINT whiter than white , THEN you gonna be muddied . Is this the same national park that the Tories did not want and campaigned against? Surely this is not the site that winter wonderland is potentially using this year – perhaps Uncle Mick and Aunty Mary would tell all ! @HJarrs Taking into account your wretched Green Councils’s obsession with letting gypsies trash significant parts of Brighton parks, you are in absolutely no position whatsoever to criticise!